It is more than likely that the impeding gambling license approval in Iowa’s Greene County for the operation of a new casino is going to be the last in the state for the foreseeable future. Iowa’s Racing and Gaming Commission is leaning towards putting a stop to issuing further gaming licenses this session. The Racing and Gaming Commission’s Chair, Jeff Lambarti, promised a final decision soon. 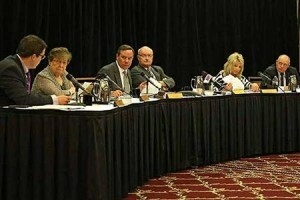 He said, “You can fully expect that in our next meeting in July we will be making some statement about where this current commission sees the future…obviously the issue being any future expansion of gaming in Iowa”. In April the commission voted 3-2 in the Greene County case and many believe that the somewhat indecisive vote reflects reluctance on the Commission’s part to advocate further expansion. When asked if the votes mean a stop on a possible expansion in the gambling sector Lambert commented, “I think that’s a safe assumption. I think the thing that we’ll talk about over the next month or so is what that looks like in terms of an action or statement from the commission about what we expect.” He also mentioned that the upcoming commission meeting in July could result in a more definite decision on stopping licenses.